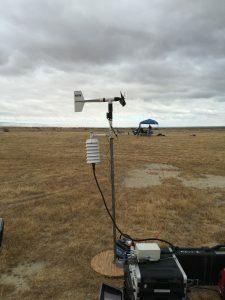 Wind and weather data collection devices at Meadows Field Airport during 206B main rotor blade acoustics testing. According to FAA Advisory Circular 36-4C and 14 CFR Part 36 Amendment 36-14 issued in 1988, entities seeking changes to original type certificates or new supplemental type certificates for most helicopters must demonstrate compliance with either Stage 1 or Stage 2 noise limits. On its applicable STC programs, VHA hired consultants to assist with the acoustics testing, data collection, and data analysis. For more information, click on the link relating to the applicable STC program. The UH-1 tail rotor blade program was not required to perform acoustics testing, so we do not have measured data for our Huey blades.